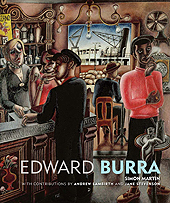 My first port of call is Simon Martin’s monograph on Burra, my Book of the Week. There is one brief mention in Chapter 3 (‘The Danse Macabre: Burra’s Dark Side’) of Burra’s 1937 visit to Mexico, of which the main legacy seems to have been a fascination with Mexican ‘Day of the Dead’ imagery, a powerful stimulus in later works such as Skeleton Party 1952-4. Some further background reading leads me to conclude that the RA may have slightly overplayed Burra’s connection with Mexico. He visited by chance in May 1937 with his friends Conrad Aiken and Mary Hoover, who were travelling to Mexico from Boston so that Conrad could obtain a divorce and marry Mary. Burra became extremely ill with dysentery, and by July he was back in England, having spent time in Mexico City initially and then in Cuernavaca with Aiken’s friend Malcolm Lowry. That’s really it. As Simon Martin notes, Burra’s eclectic, eccentric and exuberant paintings drew on a vast range of influences, from Renaissance and Baroque art to German 1920s Neue Sachlichkeit painting, Hollywood cinema, jazz music, French literature, avant-garde photography, and Parisian dance revues. His extraordinary and still far too little-known output incorporates street scenes, landscape and still-life paintings, stage designs and book illustrations. In the course of a 50-year career, Mexico was but a brief moment.